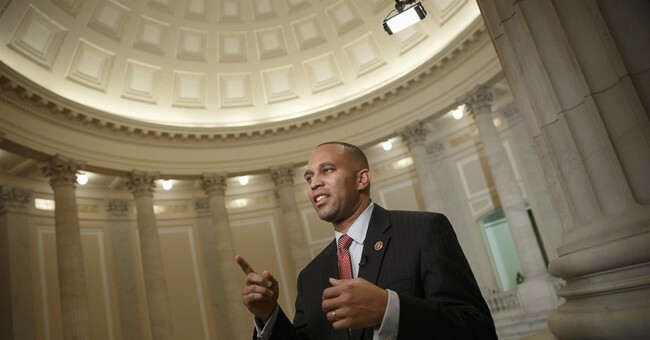 Rep. Hakeem Jeffries (D-NY) told ABC's "This Week" Sunday that President Trump was holding Americans hostage over his demand for $5 billion in funding for the border wall. The debate over that funding resulted in a partial government shutdown last week. In response to a question about why the $2.5 billion compromise on border wall funding from the White House was not a good option, he called any amount of money for the wall a waste. House Democrats have reportedly decided on a strategy to reopen the government but maintain current levels of funding for border security. However, they noted that the Senate passed a similar stopgap bill in December but Trump rejected it. The GOP-controlled Senate will not be advancing a bill on the issue that does not have President Trump’s backing. “It’s simple: The Senate is not going to send something to the president that he won’t sign,” Don Stewart, Senate Majority Leader Mitch McConnell’s spokesman, told the Post in an email. President Trump tweeted Monday morning doubling down on his support for the wall and asking Democrats to come back to D.C. early to pass a bill to fund it and reopen the government. He also pointed out that Democrats have supported the idea of a wall in the past despite their claims that it is outdated technology.